Gina Spadafori is the pet-care columnist for the Universal Press Syndicate and the award-winning author of Dogs For Dummies(r) and Cats For Dummies(r). Brian L. Speer, DVM, Dipl. ABVP ECAMS, is president of the Association of Avian Veterinarians. PART I: Which Bird For You? Chapter 1: Birds and Humans: It's Only Natural! Chapter 2: Narrowing the Choices. Chapter 3: A Bird of Your Own. PART II: Caring for your Bird Properly. Chapter 4: All the Right Stuff. Chapter 5: Starting Your Bird Off Right. Chapter 6: The New Art, Science, and Fun of Feeding Birds Right. Chapter 7: Beyond Food and Water: Bird Basics. PART III: Keeping your Bird Healthy. Chapter 8: How Birds Work: The Short Course. Chapter 9: A Preventive Care Approach to Your Bird's Health. Chapter 10: Your Bird in Sickness - and Back to Health. Chapter 11: Lifelong Care for Your Bird. PART IV: Living Happily with your Bird. Chapter 12: Getting to "Good Bird! ": Dealing with Behavior Problems. Chapter 13: Living in a Multiple-Bird Household. Chapter 15: Ten Steps to a Healthy Bird. Chapter 16: Ten Questions to Ask When Buying a Bird. Chapter 17: Ten Must-See Avian Web Sites. Chapter 18: Ten Best Birds for Beginners. Chapter 19: Ten Common Dangers to Your Bird's Life. 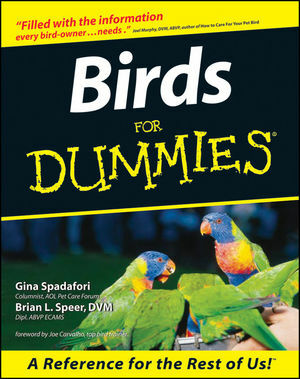 Chapter 20: Ten Disaster-Planning Tips for Bird-Lovers. Chapter 21: Ten Classic Bird Jokes (Just the Clean Ones).